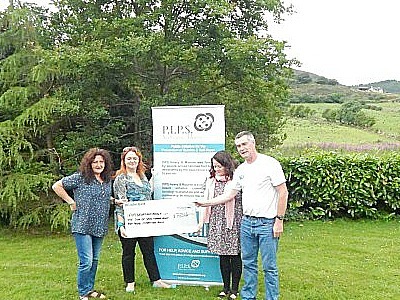 It is with great pleasure that PIPS Newry and Mourne accept a cheque for £785.41 from, The Peadar O'Doirnin Folk Society Forkhill, the organisers of the Fleadh Rua or Festival of the Red Heads in Forkhill. Special appreciation is sent to Briege Murphy, Ceol Rua, Paula Flynn, Anne Donaghey, Caoilfionn O'Hanlon, Padriag McCoy and Dara McCoy who helped tremendously in the organisation of the Fleadh Rua. This, the inaugural event was a huge success. It took place in the INF Hall on the 14th June. A large crowd of well over 200 people enjoyed the event and are already looking forward to next year with great anticipation. Pictured L -R Briege Murphy, Caoilfionn O'Hanlon, Paula Flynn, John Mallon PIPS Newry and Mourne.